When this compilation was announced on ChondriticSound it created quite a buzz. And indeed it is an outstanding release. Check out the review after the jump. 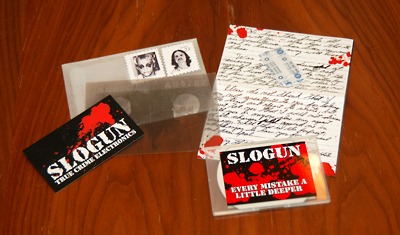 NY’s very own Slogun released a couple of bizcard-cdrs throught out the last few months. Each of the little comes in luxurious packaging, ranging from small envelopes over a petri-dish to a camo-wallet. In addition countless inserts can be found in each of the packages. There are pins, razors, a condom, flyers, small photographs, stamps and much much more. The amount of work that flew into the packaging alone must have been enormous. Italy seems to be quite active when it comes to alternative as of lately. I know of lots of new metal bands and there is a lot of buzz in the noise/power-electronics/industrial genre too (at least so it seems). 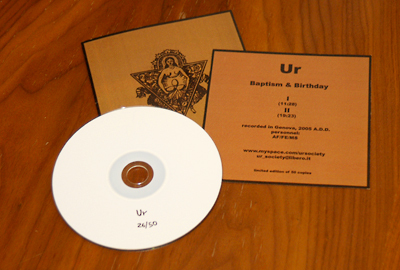 One of the new (ok, there have been around for some years but kept quite a low profile) mediterranean projects is UR, which sent me their current efforts „Baptism & Birthday“ and „Triadic Memories“. „Retrocuts“ is a compilation of out-of-print material from the extensive Dead Body Love backcatalog, originally released on tape. Gabriele himself compiled the material and transfered it from tape to digital-medium. No remastering or remixing (besides checking the meters) so „Retrocuts“ should be quite near to the original sound. Raw synth pulses and a shout of „Scum eater! 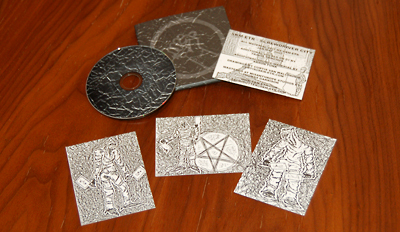 The rugged meat cleaver!“ open this 3“ pro-pressed cd by SKM-ETR. 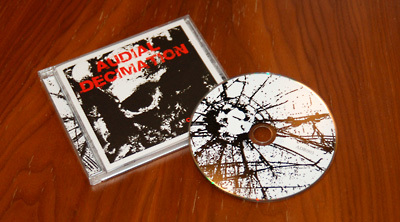 The melodic approach of the „The rugged meat cleaver“ album is gone, this is harsh, dirty and gritty power-electronics. The opening „We tell you“ is total inferno. If there are any vocals (besides the allready mentioned shout) they are buried beneath walls and walls of massive, blistering noise.